So, on the wiki page for the mobile game, it says that Elise fights with summoning magic. There are two video clips on YouTube covering the entire scenario she appears in, but we never actually see her fight. I know not many of us have played the mobile game, but what might anyone assume her magic actually involves? I'm not into mobile games, but well, is it known what does she summons?? Btw, I know it's out of topic but what's that stuff with magical girls wearing nun's clothes? 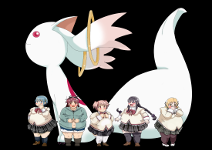 There is one in Madoka's mobile game, there is one in Magical Girls Raising Project, I don't know. Are nun's clothes so interesting/attractive? What's a point in wearing such outfit when one is not a real nun?? Have you played this game?? ...it's possible in my own ficseries that she might summon Witches with cards, implying that the canon exists as a parallel universe of sorts. I have another possible answer for that kind of magic. She might be able to summon her latent future familiars. They must be somewhere, lurking and waiting in the dark back of every magical girl's mind. Why couldn't she release them time to time? Like canon Sayaka did with her own witch form after Homura's world rebuild. (Which, IMO, is a way bigger stretch than letting the girls control their own familiars.) Like the way my has-already-stared-in-the-abyss Homura subconsciously uses telekinesis. Fridge horror: she did have telekinesis in the series as she used it when she drove that truck in Walpurgis' face. Subject: Re: Elise's summoning magic?